The Muon g-2 experiment at Fermilab, which has been six years in the making, is officially up and running after reaching its final construction milestone. The U.S. Department of Energy on Jan. 16 granted the last of five approval stages to the project, Critical Decision 4 (CD-4), formally allowing its transition into operations. The experiment will send particles called muons — heavier cousins of the electron — around a 50-foot-wide muon storage ring that was relocated from Brookhaven National Laboratory in New York state in 2013. The uniform magnetic field inside the ring exerts a torque that affects the muons’ own spins, causing them to wobble. In the early 2000s, scientists at Brookhaven found the value of this wobble, called magnetic precession, to be different from the “g-2” value predicted by theory. At Fermilab, the Muon g-2 experiment aims to confirm or refute this intriguing discrepancy with theory by repeating the measurements with a fourfold improvement in accuracy, up to 140 parts per billion. That’s like measuring the length of a football field with a margin of error that is only one-tenth the thickness of a human hair. If the experimental deviation from theory turns out to be real, it would mean that undiscovered forces or particles beyond the Standard Model — the theoretical framework that describes how the universe works — are appearing and disappearing from the vacuum to disturb the muons’ magnetic moment. “Well, if we find the measurement is consistent with theory, it will allow us to narrow our search for new physics, since it will rule out some current models that would no longer be viable,” Polly said. For example, Polly added, there are theories positing the existence of supersymmetric particles — superheavy partners to those in the Standard Model — and new categories of particles that could be the constituents of the mysterious dark matter, which makes up 80 percent of the universe’s mass. Some of these theories would no longer be valid. All that’s left now is to finish fine-tuning the instruments so the experiment can start its several-year run of data collection. Muon g-2 operations got a head start in June 2017, when the team fired up the particle beam to start calibrating the detectors and tweaking components that required additional work. 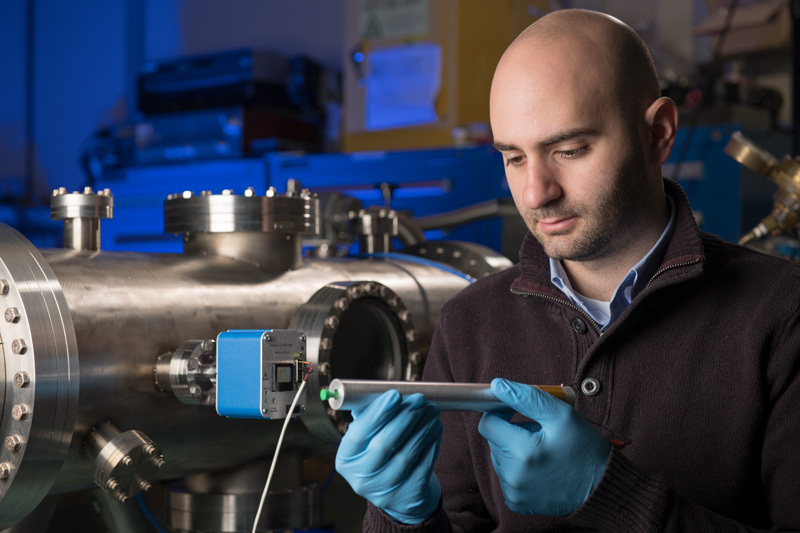 “Since the accelerator turned back on in November, we have been commissioning the beamlines, the storage ring and the rest of the experiment,” said University of Washington physicist David Hertzog, Muon g-2 co-spokesperson. As early as next month, Muon g-2 will be ready to start collecting physics-quality data at Fermilab and explore the nature of the previously measured g-2 discrepancy. David Flay holds one of the probes that Muon g-2 scientists will use to map the magnetic field inside the experiment’s storage ring. Photo: Reidar Hahn. Muons are mysterious, and scientists are diving deep into the particle to get a handle on a property that might render it — and the universe — a little less mysterious. Like electrons – muons’ lighter siblings – they are particles with a sort of natural internal magnet. They also have an angular momentum called spin, kind of like a spinning top. The combination of the spin and internal magnet of a particle is called the gyromagnetic ratio, dubbed “g,” but previous attempts at measuring it for muons have thrown up intriguing surprises. The goal of the Muon g-2 experiment at Fermilab is to measure it more precisely than ever before. To reach these remarkable levels of precision, scientists have to keep very careful tabs on a few parts of the experiment, one of which is how strong its magnetic field is. The team has been measuring and tweaking the magnetic field for months and is now very close to achieving a stable field before experiments can properly begin. “We’re in the experiment’s commissioning period right now, where we’re basically learning how our systems behave and making sure everything works properly before we transition into stable running,” said David Flay, a University of Massachusetts scientist working on the calibration of the magnetic field for Muon g-2. Muon g-2 is following up on an intriguing result seen at Brookhaven National Laboratory in New York in the early 2000s, when the experiment made observations of muons that didn’t match with theoretical predictions. The experiment’s 15-meter-diameter circular magnet, called a storage ring, was shipped to Illinois across land and sea in 2013, and the measurement is now being conducted at Fermilab with four times the precision. When Brookhaven carried out the experiment, the result was surprising: The muon value of g differed significantly from what calculations said it should be, and no one is quite sure why. It’s possible the experiment itself was flawed and the result was false, but it also opens the door to the possibility of exotic new particles and theories. With its four-fold increase in precision, Muon g-2 will shed more light on the situation. To measure g, beams of muons circulating inside the experiment’s storage ring are subjected to an intense magnetic field – about 30,000 times the strength of Earth’s natural field. This causes the muons to rotate around the magnetic field, or precess, in a particular way. By measuring this precession, it is possible to precisely extract the value of g.
The strength of magnetic field to which the muons are exposed directly affects how they precess, so it’s absolutely crucial to make extremely precise measurements of the field strength and maintain its uniformity throughout the ring – not an easy task. If Muon g-2 backs up Brookhaven’s result, it would be huge news. The Standard Model would need rethinking and it would open up a whole new chapter of particle physics. A leading theory to explain the intriguing results are new kinds of virtual particles, quantum phenomena that flit in and out of existence, even in an otherwise empty vacuum. All known particles do this, but their total effect doesn’t quite account for Brookhaven’s results. Scientists are therefore predicting one or more new, undiscovered kinds, whose additional ephemeral presence could be providing the strange muon observations. The magnetic field strength measurements are made using small, sensitive electronic devices called probes. Three types of probes – fixed, trolley and plunging – work together to build up a 3-D map of the magnetic field inside the experiment. The field can drift over time, and things like temperature changes in the experiment’s building can subtly affect the ring’s shape, so roughly 400 fixed probes are positioned just above and below the storage ring to keep a constant eye on the field inside. Because these probes are always watching, the scientists know when and by how much to tweak the field to keep it uniform. For these measurements, and every few days when the experiments is paused and the muon beam is stopped, a 0.5-meter-long, curved cylindrical trolley on rails containing 17 probes is sent around the ring to take a precise field map in the region where the muons are stored. Each orbit takes a couple of hours. The trolley probes are themselves calibrated by a plunging probe, which can move in and out of its own chamber at a specific location in the ring when needed. The fixed probes have been installed and working since fall 2016, while the 17 trolley probes have recently been removed, upgraded and reinstalled. The team developed some innovative solutions to tackle this problem, including a barcode-style system inside the ring, which the trolley scans to relay where it is as it moves around. Muon g-2 is an international collaboration hosted by Fermilab. Together with scientists from Fermilab, Argonne, and Brookhaven, several universities across the U.S. work with international collaborators from countries as wide-ranging as South Korea, Italy and the UK. In total, around 30 institutions and 150 people work on the experiment. The team is working to finish the main field strength measurement part of the commissioning process by early 2018, before going on to analyze exactly how the muons experience the generated field. The experiment is planned to begin in full in February 2018.